Author Sharna Jackson is something of a rarity. As a black children's writer, she's already in a minority. 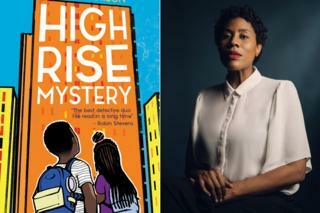 But her debut book High-Rise Mystery, a detective story starring young black sisters and featuring a diverse cast, puts Jackson in an extra select league. "When I was young, I kept on reading and watching but the representation wasn't there," Jackson tells BBC News. "It was hard to find role models outside popular culture. According to the recent report BookTrust Represents, covering 2007-2017, just 5.6% of published UK children's authors and illustrators are from a black and minority ethnic (BAME) background. Only 1% had a character of colour as lead. In many cases, the stories were about social justice issues or conflict rather than mystery, magic or fun. And, she says, the quality of the representation is vital too. "All children need to see themselves and others reflected in culture - representation leads to empathy. That visibility is extremely important, but so is moving away from stereotypes and one-note, 'prop' characters. "I don't just want to read about black children in 'issue-based' narratives. Why can't black children exist in 'white' genres? Why can't they see themselves being clever, creative and having fun?" Lack of representation can lead BAME children to become dispirited by reading and quashes ambitions to enter publishing, so extending the problem into the adult market. This was recently highlighted in a campaign to encourage more women BAME crime writers, backed by JK Rowling and other big names. Jill Coleman of BookTrust says: "The world that children's books represents has a huge impact on how young readers see themselves and the world around them and on their aspirations for the future." Former Children's Laureate Malorie Blackman said in 2014: "A very significant message goes out when you cannot see yourself at all in the books you are reading... it is saying 'well, you may be here, but do you really belong?'" Jackson says she'd always harboured a desire to be an author but concentrated on her career as a curator engaging children in the arts. She loved old-fashioned detective stories, such as Poirot and Sherlock, as well as the concept of mash-up genres. Her idea was to combine the two in a children's novel, one that embraced diversity, felt relevant and empowered its readers. "I thought it'd be really interesting to take a traditional murder mystery and set it in a council estate and see what happened," says Jackson. "I also thought it's important to be writing stories where young diverse people can see themselves and doing interesting things." When Knights Of, an inclusive children's publisher, was founded by Aimee Felone and David Stevens in 2017, Jackson "reached out to David on Twitter and he said, 'why don't you consider writing a book?'". High-Rise Mystery stars black sleuthing sisters Norva, 13, and Nik, 11, living on a London council estate. Their latest, and biggest, case is uncovering who killed Hugo, the much-liked art teacher and antiques dealer. They are super smart and eagle-eyed. And their skilled use of technology, analytics and gut instinct keeps them one step ahead. Nik and Norva are also chalk and cheese. "They are both like me but different parts of my personality," explains Jackson. "I went through a phase where I loved shaving my head because it was really practical and that's like Nik. She's very straightforward and 'bish, bash, bosh,' gets things done. "Norva is more flighty and dramatic and that can also be me." The story has an eclectic cast of varied age, background and foibles. "I wanted to make them feel engaging and like people you want to spend time with even if they were doing bad things," says Jackson. But their ethnicities are only implied. "My thinking was that if a character is black it doesn't occur to them that they are. That is just the default," says Jackson. Jackson grew up in Luton, which she describes as a "much maligned town that has a lot to celebrate" and didn't want to perpetuate the similar negative stereotype suffered by housing estates. "I worried for a second but the fact is there are black people on estates and instead of shying away from it, let's try to tell some interesting stories," she says. "Estates get a bad press but there are people living there having good lives and doing great things. "I was friends with children who lived on estates and I was always struck by the sense of community and everybody mucking in. It felt really special." And she hopes her story will appeal regardless of background. "It will give a window onto a world that's completely different. It may not be not directly relevant to their lives, but neither is going into space." Jackson's son Joseph kept the story grounded. They transformed their home into a makeshift police investigation room, with Post-it notes over the walls and up the stairs. "He was especially brilliant at collecting quotes and thinking of possible murder methods and weapons, which was a bit worrying!" says Jackson. "But his input helped keep the writing in touch with who was writing it for. Input from kids is a vital part of writing or creating anything for children - it makes the end product better." For the push for more BAME children's stories and authors to be more than a trend, the encouragement has to be ongoing, says Farrah Serroukh. She also says under-representation is not limited to the UK, illustrated in the US by the University of Winsconsin-Madison's research. Initiatives in publishing and in schools are up and running or in the pipeline, galvanised by the CLPE report, she says. The report will now be issued annually. Knights Of is an independent publisher aiming to foster diversity in their authors and workforce by demystifying the industry. "Publishing is so secretive. And you have to know the right people to get ahead. There's a lack of knowledge within certain communities of the routes into publishing," says Aimee Felone. "And then there's not seeing themselves in bookshops. Before you can even consider being a published author you have to see yourself as one. "That's not to say that people should only be able to write the background that they're from, but we need to address the fact that there aren't enough authors from Asian or minority ethnic backgrounds. "Then we can see about exclusion across the board."